Idée Fixe: Vintage Lingerie Collection -- Warning Pic Heavy! Vintage Lingerie Collection -- Warning Pic Heavy! I finally started taking photos of some of my vintage lingerie collection. I'll warn you, this barely scratches the surface and I probably have about three or four more pic heavy posts to show you my complete collection. Remember, I started collecting when things like this weren't desireable so I had my choice and my choice of price as no one thought it was worth much for someone to want someone's old lingerie! Lingerie has always been a passion of mine, and when I started my indie design company I focused on lingerie. I strove to make vintage style lingerie but with a modern twist. I did phenomonly well, but it got to the point where I had to make a difficult choice: choose an investor, losing control of what I created, or try to keep going it alone. Going it alone proved too difficult so I shuttered in the early to mid-90s. I can't imagine whats involved now, back then everything was still very much the punk DIY aesthetic, and we just did it. And were lucky enough for trendy boutiques to take chances on unknowns. It must be terribly stressful for indie designers today, the money involved alone boggles my mind! If you're an indie designer today, I'd love to hear your experiences. This is a peignoir set from the 60s. I don't know if you can see the hemline, but its sort of ragged or zig-zagged looking. I suppose they were going for a "cavewoman" look! Kinda nuts as the collar and cuffs on the robe are edged in velvet! 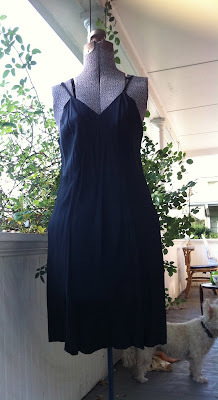 The nightgown underneath is just a simple sleeveless shift style. 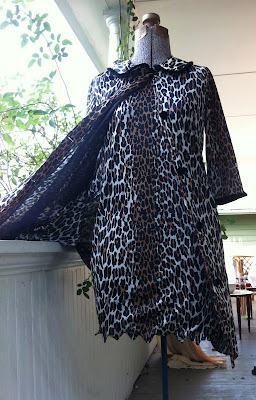 Another leopard lovely, also from the 60s. This is what would've been considered a "hostess" gown, something to throw on when unexpected company arrived. It zips up the front and can be worn partially zipped for a v-neck look, or as pictured, zipped all the way up creating a turtleneck. 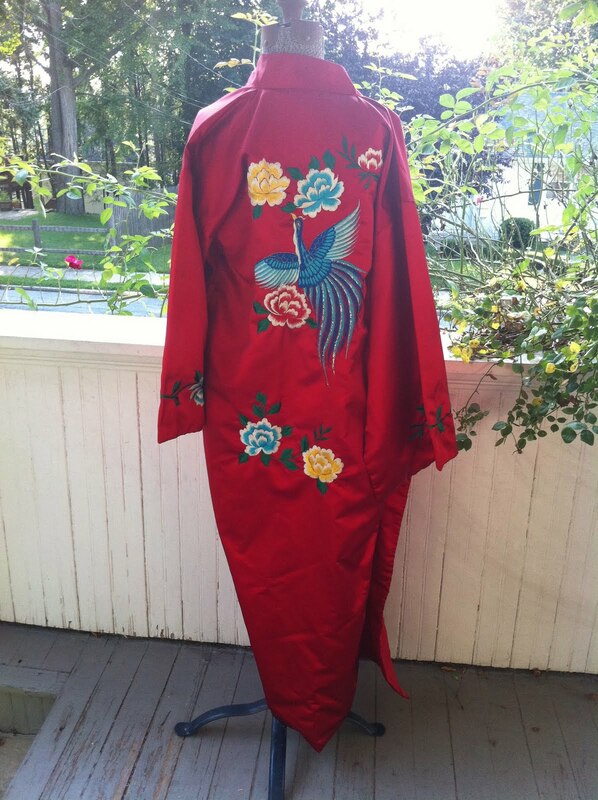 I'm not exactly sure of the date of this beautiful kimono, but am fairly certain its from the late 50s-early 60s. The colours are so vibrant, and I love the design. The front is plain with all the design on the back. 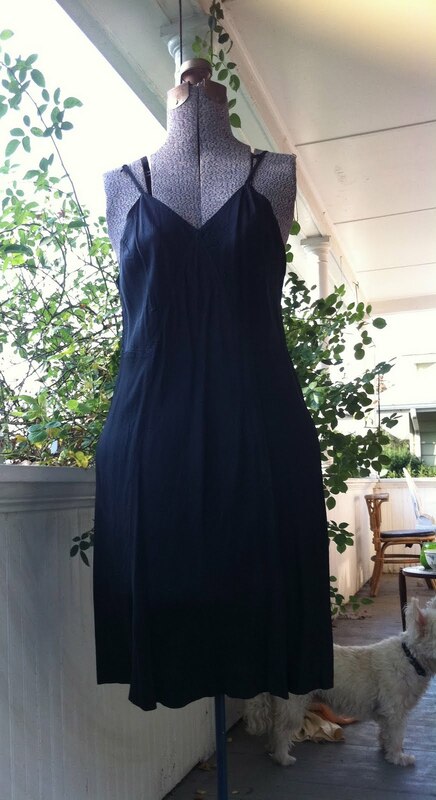 This is a 30s bias cut nightgown. It has (as many from that era do) ties in the back. 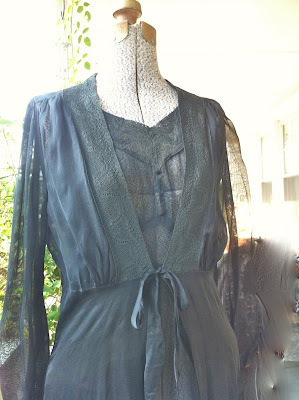 The lovely lace around the neckline makes it a little more special than the average 30s nightgown. This is another 30s bias cut nightgown. Its such a pale buttery yellow that I don't think it photographed that well. What's unusual is that I found its twin the same day (in the same shop) in pale pink! I'm fairly certain this is from the 20s. Its homemade, so there aren't any tags to give me a clue. 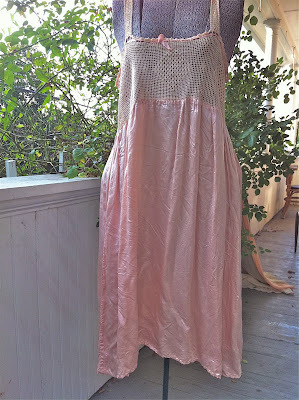 The top is crocheted lace, and the bottom is pink silk. This is just a simple bias cut slip from the 30s. Nothing fancy, very basic, but very versatile. This is a 30s peignoir set. Its so difficult to find both the robe and the nightgown, so whenever you do, you've found a treasure! This is another full length shot of the same peignoir set. 1930s bias cut nightgown with ties in the back. 1930s bias cut silk nightgown. 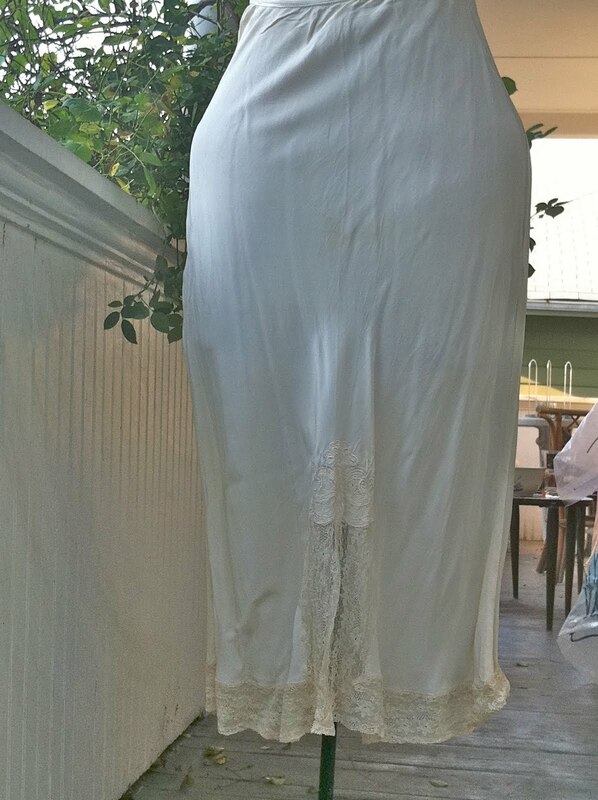 Its hemmed in beautiful lace. 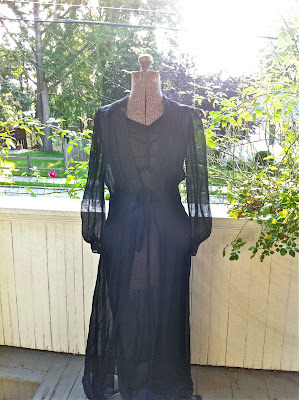 1930s silk bias cut nightgown. 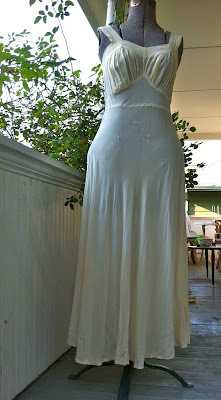 Simple 1930's bias cut silk nightgown. I purchased this on my honeymoon so of course I have fond memories of it. 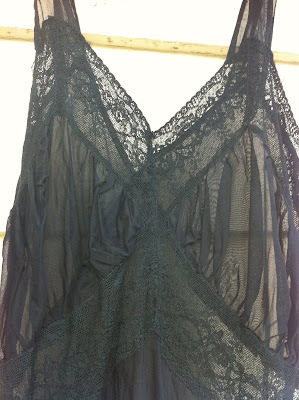 Its got lovely cutwork around the neckline. 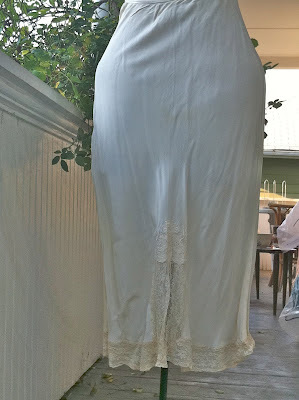 Simple 1930s bias cut silk half slip. They make great skirts! Interesting seamed 1930s silk half slip. Its a little more pink than peach which was more common. Cream silk 1930s half slip. I love the lacework! 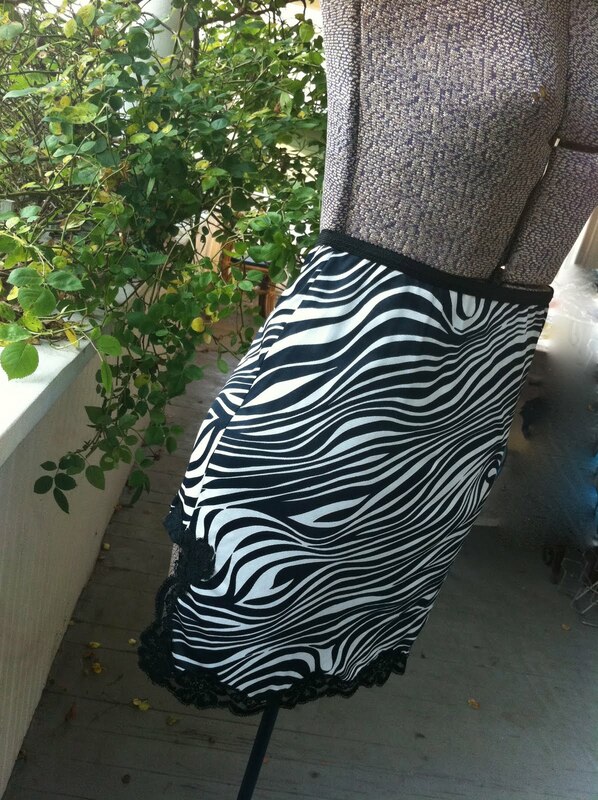 60s zebra half slip. The Punk Glam Princess (now my official photographer!) tried to photograph it so you could see the lace edged slits on each side. 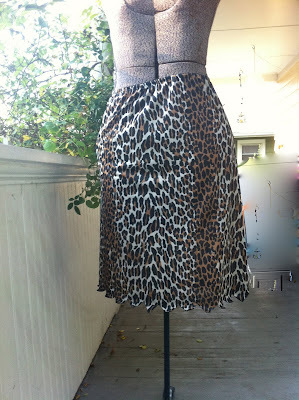 And yeah, I've worn this as a skirt too! 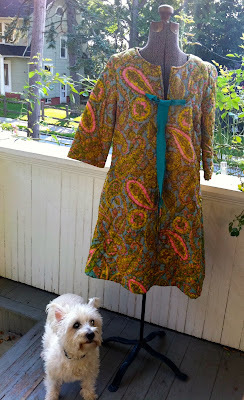 1960s faux Pucci. I love the colour combo and the swirly design. 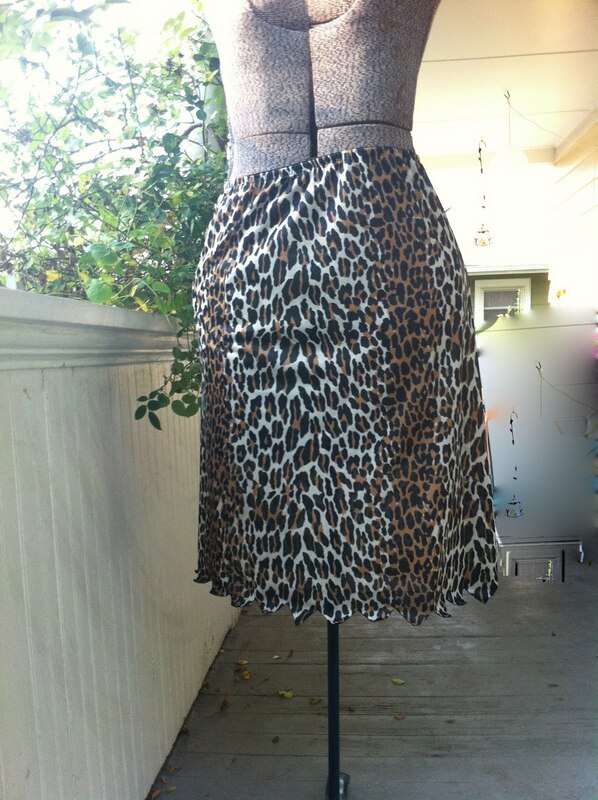 60s leopard half slip. Note the hemline is the same as the peignoir set, going for that "cavewoman" look again I suppose! Well that's the end of part one. It'll take some time before I get around to gathering up enough pieces for part two as I have far too much! I'm actually thinking at this point it might be time to let go of some pieces because its starting to feel like I'm hoarding! But we'll see if I can manage to let go of any pieces, they're all so special in their own way that choosing will be a difficult task indeed! I'd love to see others collections too, c'mon we've got a Frock it on a Friday, maybe we can start a "Vintage Lingerie Day" too! Haha, yep Wilma Flintstone fits that slip perfect! I love that on the other side of the world you have the same one! It's scary as I started taking pictures and realised this is only about a quarter of what I have. I honestly need to cull but they are so precious to me that I just can't. Plus they're small and easy to store, heehee! Eventually I'll get some more out to photograph, it's a huge job unloading the trunks! Oh wow how awesome is part 1 cant wait to see part 2 now.Lingerie day? Hmm not sure if any of my vintage lingerie would fit me now.Some I have had for years and fitted me then but was in my 20s then too. Nelly dear don't hold your breadth for part two, it took me ages to get part one done! if they're bias cut they may still fit. It's amazing how many different sizes a bias cut gown can fit! Otherwise just hang it or out it on a mannequin! Thank you Vix! I'm thinking I might have to break it down to a few a week to get the rest shown, there's just so much! And I do wear nearly all of it, so it's not like it's just sitting tucked away. Which is why it will be so hard to cull! I knew you'd love the psychedelic one, it's very you! The red kimono is stunning! Simply Fabulous, I think when I acquired it (maybe 25-30 years ago) it had never been used and since I've taken really good care of it so it's stayed as vibrant as when I got it! AH the leopard! Wow what great posts! Thanks Jeanne! You know how bad my hoard is!